Is it affection? Or just my imagination? The barn was dark. It always is on winter evenings. We keep the power to the barn off, most of the time, to lower the risk of fire. Instead, we operate with headlamps as we make our way through evening chores. Heads reach over each stall as I pass through, noses touching my arm, or soft breathe blown on my cheek. The quiet greetings are welcome after a day at the office, filled with meetings and people wanting things from me. As hay is passed out, heads disappear, and rhythmic munching begins. Outside, the tree frogs are in full chorus. Two sounds that bring peace to my soul, blending as the day fades from my mind. I take Noble his grain hay portion, as he nibbles at the alfalfa my mother has already thrown him. The portion is loose, and I drop a piece as I throw the rest over the low wall. I bend over to salvage the morsel – nothing goes to waste! As I straighten, I find myself facing a warm chestnut muzzle. 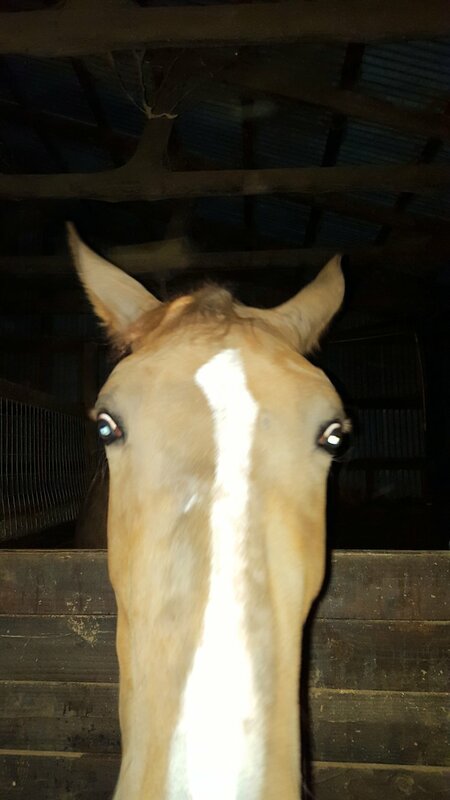 Two piles waiting in his stall, Noble nuzzles me before eyeing the small wad in my hands. “Oh, you want this?” I ask, as he patiently stands gazing at the handful. Although he could easily have snatched it, he waits until I move it slightly toward his nostrils and say “Okay.” I stand in the dark, his huge head hung over my shoulder, as he carefully extracts each strand from my cupped hands. As I listen to the soft munching at my ear, I ponder why he would choose this small morsel over the hay at his feet. The human in my brain says, “The other pieces aren’t going anywhere, so why not make sure you get every morsel you can?” Makes sense. But he could easily grab the entire handful in one bite, then take it back into his stall to eat as he wanted. Instead, he seems to be very intentionally taking it wisp by wisp. I smile, and reach back to scratch his neck, now that the hay fits into one hand. He continues to pull each wisp, but inevitably knocks some to the ground. When my hand is empty, he stands chewing methodically, as I continue to scratch. As the chewing slows, he touches my chest with his muzzle – then he points his nose toward the strands that have fallen at my feet. “Oh, you want those, too?” I say with a slight chuckle. I gather up the loose wisps and offer them to my giant companion. He returns to his methodical plucking of the strands, until the last of it is gone. I return to scratching, and he stands peacefully now, ignoring the rest of his hay completely. I finally give him a pat. “I have to check waters. Go back to your food.” As I walk away, he watches for a moment, before returning to his hay and joining the others in their chorus of rhythmic munching. People often question whether and how we can tell if our horses like us. Sometimes it is out of genuine interest, and sometimes it is a challenge with an agenda behind it. I have given up answering their questions. I cannot know if Noble feels affection for me, or if he just wanted to make sure that he got every morsel that he could. But if you live your life with animals, honoring their individuality and believing they have feelings, emotions, and thoughts, then you begin to sense those things in their aspect. Stress, tension, relaxation, contentment – all are things that you can sense. There are markers I can point to, but it goes well beyond those specifics. Be good to your horses – and they might just return the favor. 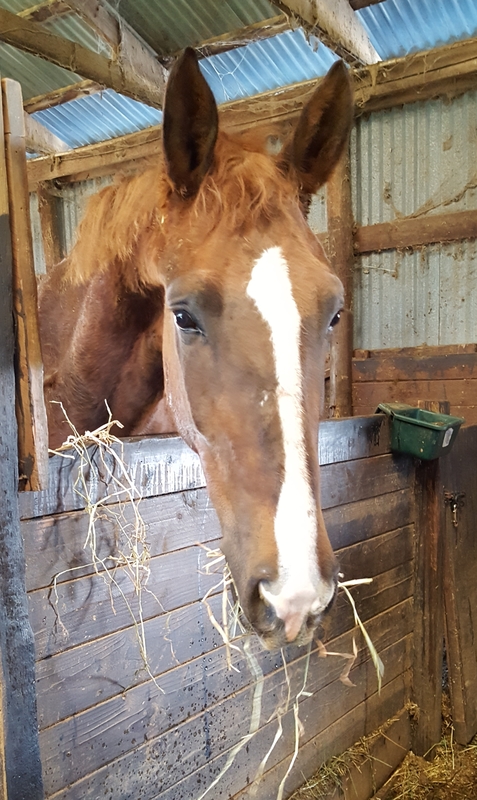 This entry was posted in My Journey and tagged affection, evening feeding, feeling content, human horse bond, Neil ffrench Blake, Noble, quiet moments, scratching, The World of Dressage, time in the barn. Bookmark the permalink. 3 Responses to Is it affection? Or just my imagination? I do believe they give us affection at times and sometimes it comes after we have been absent or other times if they sense we have been having difficulties in some part of our lives. At least that has been my experience. I loved this post and how you told us about this lovely time with your horse. I wholeheartedly agree, Anne. For me, there can be no other logical explanation for some of their behavior. Thank you for your words, both insightful and kind.